PRINCETON, N.J. -- No single problem dominated Gallup's list of the most important problems facing the U.S. in 2016, but, at 16%, the economy averaged the most mentions. Dissatisfaction with the government followed closely at 13%. Unemployment or jobs has ranked in the top four every year since 2009, and ranked third this year with 9%. Race relations ranked fourth with 8%, the highest annual average for this issue in recent years. Top Four Issues Americans Named as Most Important Problem Facing the U.S.
Each month, Gallup asks Americans to name, in their own words, the most important problem facing the U.S. The 2016 results are based on the average responses for each issue across the 12 national surveys. At 7%, immigration was the fifth-most-important issue in 2016, just below the 8% recorded in 2015, when it tied for the third-highest-mentioned issue. The economy has historically been among the top few issues Americans identify as the nation's most important problem. However, reflecting the better economic conditions of recent years, the percentage naming it has dwindled from 40% in 2009 to less than 20% in each of the past three years. The average 16% naming the economy in 2016 is the second-lowest since the financial crisis hit in 2008, after last year's 13%. 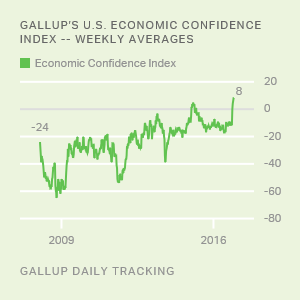 The relatively low mentions of the economy as the top problem coincide with a rise in overall economic confidence to nine-year highs. Signaling that Americans' concerns are more spread out than in years past, 2016 was the second straight year that only two issues averaged double-digit mentions as the nation's top problem, after seven years when three or more issues routinely averaged at least 10%. The 13% mentioning government encompasses a variety of complaints about the leadership of the federal government, including the Republican-controlled Congress and President Barack Obama. The government first appeared among the top four problems in 2005 and has remained there every year except 2008, when gas prices zoomed up in public concern. The 8% of Americans naming race relations over the course of 2016 is up from 5% last year and 3% in 2014, and it is the highest in Gallup polling since 1970. The 2016 average included a spike to 18% in July after well-publicized incidents involving police officers killing black men, as well as fatal shootings by black men of police officers in Dallas and Louisiana. From 2001 through 2015, only 1% of Americans, on average, thought race relations was the most important U.S. problem. Elections or the need for election reform also garnered unusually high public concern in 2016. The 6% naming it the nation's most important problem was by far the highest for this category in Gallup polling history. Mentions were generally higher in the second half of the year -- after the presidential nominees were selected -- than in the first half, peaking at 11% in November. By contrast, before this year's highly contentious presidential race between Donald Trump and Hillary Clinton, the percentage citing the election process as the top problem averaged less than 1%. Even in the past presidential election years of 2008 and 2004, just 1% named the election or the need for election reform, and in 2012 the category didn't register a single percent. With unemployment much lower today than at its peak in 2009 and with economic confidence at new nine-year highs, far fewer Americans in 2016 than in recent years named the economy as the nation's top problem. Yet, at 16%, it still averaged more mentions in 2016 than any other issue, perhaps reflecting the presidential campaign's economic themes. The government remains the object of many Americans' ire (13%). But each of the other top 10 issues -- including unemployment/jobs, race relations, immigration, terrorism, election reform, national security, the federal deficit and healthcare -- garnered less than 10%. As a result, Trump will assume the presidency at a time when a variety of serious issues are important to small segments of people. That is different from the situation Obama faced when he was first elected in 2008, when Americans largely agreed that the economy was the foremost problem. In that year, an average 39% of Americans said the economy was the nation's most important problem, and it remained No. 1 as Obama was sworn in for his second term in 2013. The current issue landscape is more reminiscent of 2000, when George W. Bush was first elected, but only in the sense that Americans' concern was highly dispersed across multiple issues. However, at that time the economy ranked sixth, mentioned by 7%, and terrorism had not yet emerged as a serious national security concern. The leading issues were more standard domestic fare such as education, ethical/moral decline, crime and healthcare. Of course, any intention Bush may have had to focus his administration on those items was upended by the 9/11 terrorist attacks in his first year, completely resetting the national agenda. Results for the monthly Gallup Poll Social Series surveys included in this analysis are based on telephone interviews conducted with a random sample of approximately 1,000 adults, aged 18 and older, living in all 50 U.S. states and the District of Columbia. The yearly averages from the combined results are based on the total sample of approximately 12,000 national adults, with a margin of sampling error of ±1 percentage point at the 95% confidence level.